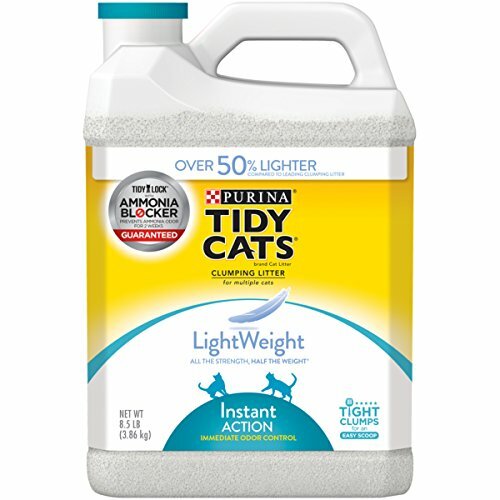 Recently, I tried Tidy Cats Lightweight kitty litter. We had the foster cat (or maybe new cat - I haven't decided yet) in the bathroom. So, this was an opportunity to try a different brand of litter. I don't believe in using scented cat litter, so I choose the unscented variety. 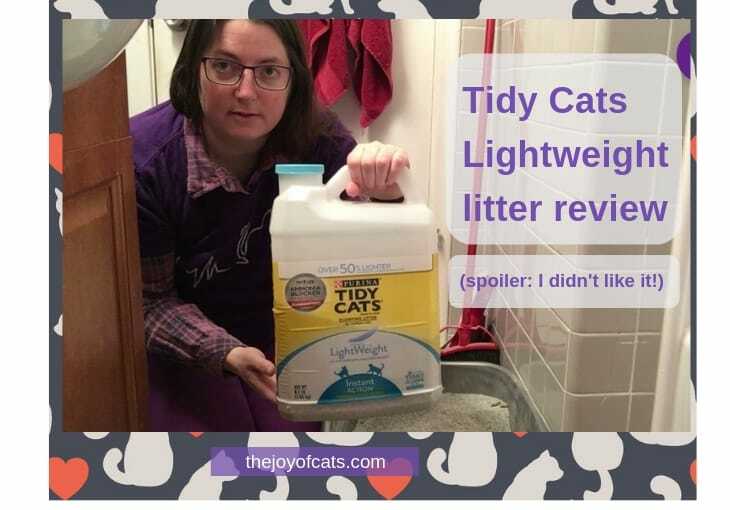 In this review, I will share in detail why I hated the Tidy Cats Lightweight kitty litter. We used other kinds of Tidy Cats in the past and they were okay. I was surprised by how much I disliked the lightweight litter. To be fair, it wasn't all horrible, so I've included a few pros. The review will focus mostly on the cons. It's light making it easy to transport the container. Not the most expensive litter. It tracks easily and everywhere. After only 3 days of use, I had enough and switched the litter out with fresh Boxiecat. You can watch the video below to hear and see my complaints about this litter! The container doesn't explicitly say that it's unscented, but I didn't see that it had scent added. The Amazon description says it has a mineral deodorizing system. This litter still had an odor to it. Maybe I would not have noticed as much if the box wasn't in a such a small room. Our bathroom isn't spacious. I could smell the litter every time I entered the bathroom and the entire time I am hanging out with the cat. By "smell the litter," I mean the actual litter pieces. Not dirty used litter. The scent seemed like perfume or something that I couldn't quite identify. It was bothersome to me, so I'm sure the cat could smell it too. Why would a cat want to smell the litter all day? I was not able to determine the exact ingredients of the litter other than a mineral deodorizing system. If you are sensitive to smells, this litter is not for you! If you have ever thought your coworker's perfume stinks or is too strong, you will not be happy with this litter. My husband, Ted, didn't notice it. But he also wasn't able to smell the natural gas when our gas meter leaked and when we had a small leak running to our dryer. So, I don't trust his nose. Update: The 100% dust free version still has the perfume like smell. I hate it! But some people might like how it smells. Update: Tidy Cats now claims that the litter is 100% dust free! I bought one container and didn't notice any dust. The smell though, of the litter is still too strong for me. The Amazon description (as of writing this) claims that the litter is 99.9% dust free. Now, I don't know how they qualify the dust level. There is going to be much more litter than dust by the nature of the product. 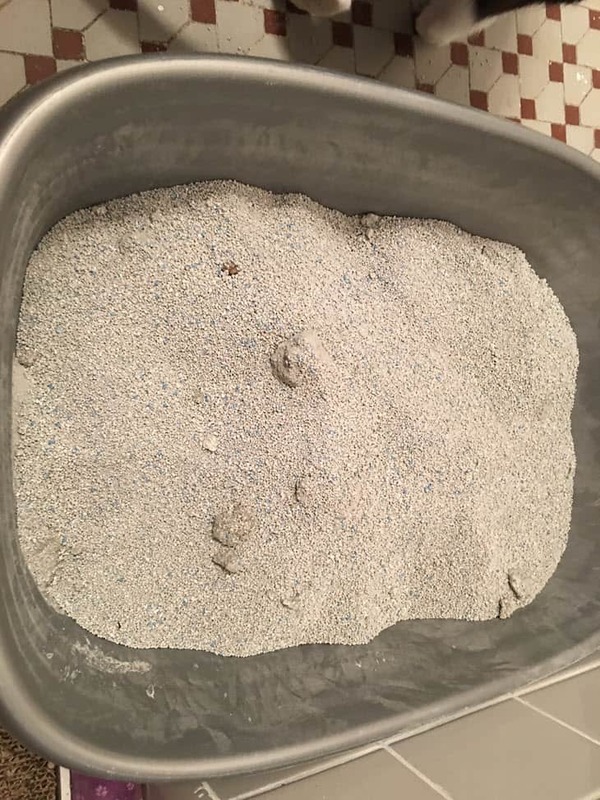 This litter is dusty beyond the initial dust when filling the litter box with it. Each time I scooped, there was more dust in the air! There was a layer of dust on the inside of the litter box! That make is it too dusty for my liking. I don't want to breathe it in or for the cat to breathe it in. The dust issue even made it onto Snopes a few years ago when Purina released the Lightweight litter! Purina states that the litter is safe. The dust amount may be safe, but my personal preference is a less dusty litter. Who wants extra stuff to clean? I'm sure the dust is on the bathroom walls!!!! The litter tracked everywhere in my bathroom. And not just a little bit. At first, we put the litter box in the bathtub. That made quite the mess as litter was tracked into the tub. That wasn't going to work when it came time to take a shower as litter going down the drain could lead to a terrible plumbing scenario. So, we moved the box out of the bathtub and put the food and water bowls in. Our bathroom is small, but it still felt like an excessive amount of litter was tracked out. And I noticed the litter was getting stuck in the cat's paws. The amount of litter outside of the box (not from the cat kicking it out) made me feel like the litter was too lightweight. 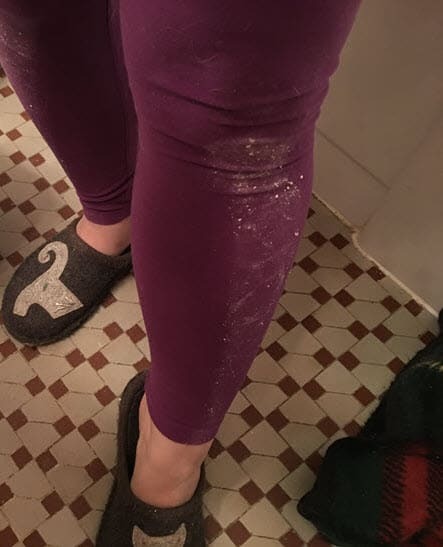 The dust on my leg in the picture above is from kneeling next to the litter box just long enough to make the video about it. That's a lot of dust and litter tracking! Read a review of the slippers I'm wearing here. If you don't mind the smell, the dust, and the tracking this litter seemed okay. It was easy to scoop. Since there wasn't much weight to it, the scooper easily went through it. The weight of the container was less than a traditional clay litter of the same volume. The clumping seemed okay. And I didn't notice any smell of ammonia or poo (this cat was good at burying his waste). Some reviews on Amazon complained about the urine going straight to the bottom of the box, but I didn't keep the litter long enough to have this issue happen. Update: The 100% dust free TidyCats litter didn't seem to last long. 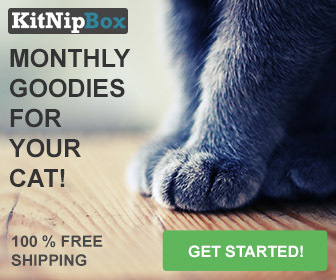 I used it for 4-5 days with a foster cat, and some of the litter had turned into the wet, sticky, mass that stuck to the litter box instead of clumping. I didn't like Tidy Cats Lightweight litter as it was too dusty, too smelly, and too much tracking. If you aren't sensitive about dust or smells or tracking, this litter is light and may work for you. I recommend Boxiecat over Tidy Cats Lightweight. Below are my ratings of this cat litter and other litters we have used.